During World War I, the military first used airplanes for reconnaissance. Planes could do in 4 hours what a traditional cavalry reconnaissance would have taken 24 hours to do. With the information planes could provide, surprise attacks were difficult and troop movements had to be done at night when the planes could not fly. Later, planes were also used as artillery spotters and for some bombing. To try to disguise their operations, the combatants shot at the scouting planes from the ground and sent their own pilots up armed with rifles and shotguns. After Fokker designed a synchronizing gear in 1915, pilots could fire a forward-facing machine gun through the whirling propeller directly at an enemy plane. Shooting from a moving plane required practice. 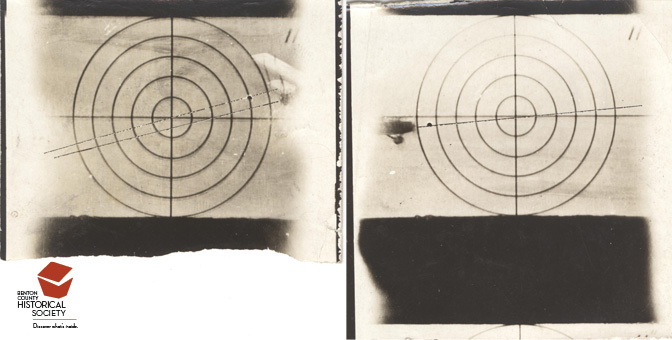 These small pin point in these photographs shows the trainee where the burst would have hit the enemy plane.